Android is a great mobile platform which brings the power of World Wide Web in your hands! With fast browsing, multi-tasking, cloud sync, and easy ways of connecting and sharing features, you can save different types of data like videos, music, and pictures on the Android phone memory. A lot of users use the Android phone like a storage device. However, the problem comes when your stored files suddenly disappear. You may experience data loss anytime and there are different reasons for that. But luckily, you can retrieve the lost data using online data recovery software for Android. 1 How to Recover Data from Android Phone? 3 How to Do Android Data Recovery? 5 How to Retrieve Lost Files from Android and save them to computer? How to Recover Data from Android Phone? Losing data on your Android phone doesn’t mean the end of your world! You can easily bring the deleted files back in your Android phone with a professional android data recovery tool called iSkysoft Toolbox – Recover (Android). It’s very popular online data recovery software for Android phone. It helps you recover different file types from your Android phone. iSkysoft Toolbox – Recover (Android), makes android data recovery easy and efficient. You can recover deleted or lost files from the android phones or tablets of any brand. You can easily recover contacts, videos, photos, call history, messages, WhatsApp and documents from the Android phone. You can also recover data from the broken Samsung phones. It’s a fact that data on any Android device can be lost easily because of different reasons. So, a professional and reliable android data recovery program like iSkysoft Toolbox – Recover (Android) can help you recover that data loss. You can easily recover the lost data with just a few clicks with different scenario like Accidental Deletion, Dead Phone, System Crash, Water Damaged Phone, Screen Broken, Rooting Error and SD Card Issue. How to Do Android Data Recovery? 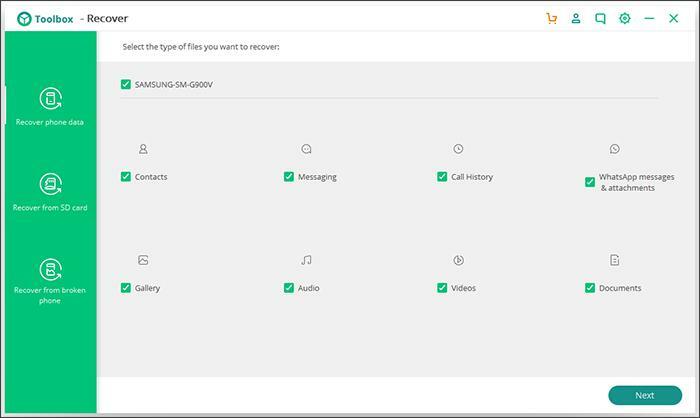 iSkysoft Toolbox – Recover (Android) can retrieve deleted or lost files from internal storage and external SD card on your Android phone or even damaged Android devices. Internal Memory: You can easily retrieve deleted or lost data from the internal memory of your Android phones or tablets. Broken Android Phone: You can easily retrieve data from your broken Samsung Android phone even if its screen is broken or it isn’t turned on! Android SD Card: You can scan your SD card to recover the files effectively. Step 1: Start the iSkysoft Toolbox and attach an Android phone with your computer. Step 2: Choose the file types and start scanning the phone. Step 3: – Preview your data and select to recover it to your computer or restore it to your phone. iSkysoft Toolbox – Recover (Android) is the best android data recovery software and it covers all the popular Android brands including SAMSUNG, Google, HTC, HUAWEI, LG, etc. It has a wide-ranging device compatibility including OS like 7.0 Nougat, 6.0 Marshmallow, 5.0 Lollipop, 4.0 Ice Cream Sandwich, 3.0 Honeycomb, and 2.3, which has made it the game-changer in the field of Android data recovery. 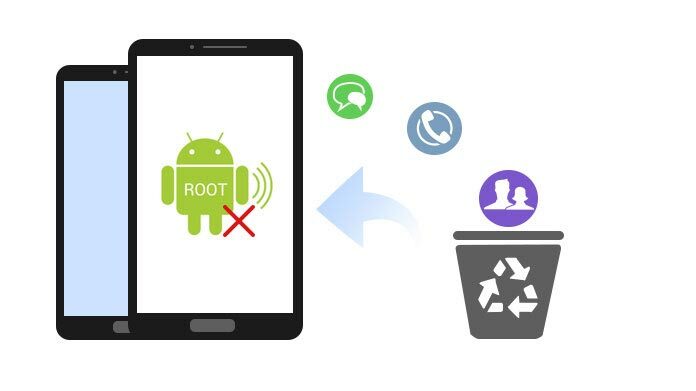 If you have a Samsung mobile with models like Galaxy Note or S9/8/7/6/5, you need to follow a tiresome procedure for recovering lost or deleted files, however with iSkysoft Toolbox; it is very easy to conduct samsung data recovery data from your Samsung Android phone. You just need to connect your Samsung device with your computer, scan the files, and that’s it! Everything will get recovered! Isn’t it great? Easy Recovery: This tool helps in easy recovery from internal storage or SD card and also helps you recover the required data only. Easy to Use: Its attractive yet easy interface makes this procedure very easy for the users. Quick Recovery: All the data on the Samsung mobile like videos, documents, WhatsApp, contacts, messages, photos, etc. are easily retrievable in the shortest period of time. Preview Before Recovery: You can easily scan all the lost files and also preview all the chosen files. How to Retrieve Lost Files from Android and save them to computer? Firstly, download and install iSkysoft toolbox on the computer and attach your Android phone or tablet with the computer using a USB cable. Ensure that you click on “Trust This Computer” option on the Android device. Once the connection gets established, just click on the “Recover” option in the main window and you will be automatically directed to another tab called “Recover from Android Device”. Now, it’s time to scan the device to search for the data lost. This tab will display two options – Deleted data from this Device and present Data on this device. You can choose any of them or both. Now, click the “Scan” button situated at the bottom right corner of the screen. The time it takes rely on the size and amount of the data files. During the process of scanning, if you find the data you want, you can click the “Pause” button to stop this scanning. Preview the data when scanning gets completed and once the scanning is completed and results are shown, review the data. If too much data is shown, you can try the search feature and type the file name. You can also enhance the search using filters like only show deleted; existing, and if you have permitted the program to scan both deleted and existing data. After successfully getting the data which you need to recover, select the checkbox shown before the box. Then click ‘Recover to Computer’ option at the low end of the window. Now you just need to select a folder where you wish to save your exported files. Retrieving the removed data from an Android device isn’t easy at all, however with iSkysoft toolbox, it has become much easier! 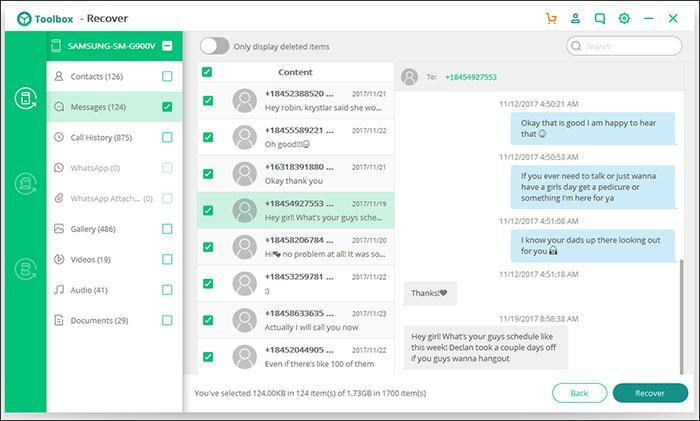 It helps you export the retrieved text messages both to Android as well as to the computer in various formats and it also helps you show the scanned messages from Android so you can choose which data you want to bring back. Moreover, iSkysoft toolbox works best for all android devices and offers users to regain deleted messages on the Android devices.